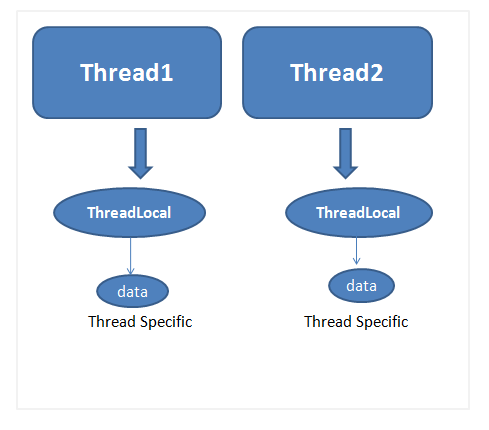 ThreadLocal class can be used in multi threaded environment and provides thread-local variables that is local to each thread. Thread that accesses thread local variable (via its get or set method) has its own, independently initialized copy of the variable. ThreadLocal instances are typically private static fields in classes that wish to associate state with a thread. Each thread holds an implicit reference to its copy of a thread-local variable until the thread is alive and the ThreadLocal instance is accessible. Once the thread is in dead state, all of its copies of thread-local instances are subject to garbage collection (unless other references to these copies exist). If you want to preserve or carry information from one method call to another you can carry it by using ThreadLocal (it is just like a thread context) and information will be available throughout the thread life cycle. It’s just a Map of name-value pairs stored inside each Thread object (see the Thread.threadLocals field). The API hides that implementation detail, but that’s more or less all there is to it. In the source – Thread.Java , file you can see below map declaration which is used to handle thread-locals.